This entry was posted in Dvar Torah new material and tagged Air Force army chaplains Jewish Marines military service Navy United States armed forces on May 27, 2015 by Marla Cohen. I recently spoke about JWB Jewish Chaplains Council and the work that it does as a program of JCC Association, where I work, at New City Jewish Center. I’ve adapted the text from the Shabbat d’var, which took place on Saturday, May 23, 2015, two days before yizkor for Shavuot coincided with our Memorial Day. Before I came to work at JCC Association, the only thing I knew about Jewish chaplains was that my mother’s first cousin, Michell Geller, an Orthodox rabbi, had sued the Air Force for the right to wear his beard. He won, by the way, and with back pay, too, according to news reports at the time. But that was about as far as my knowledge of the rabbis who serve our men and women in uniform went. Often when you say Jewish and military, people are surprised. You certainly don’t think “chaplain.” I was no different, even though clearly I had this family connection. And although our congregation includes prayers for the men and women who serve this country, and we see people who serve currently and have in the past, sitting in our midst, when we think of Jews in military service, we often think Israel. We don’t always connect that Jewish men and women serve our country as well. For me, that has changed considerably. 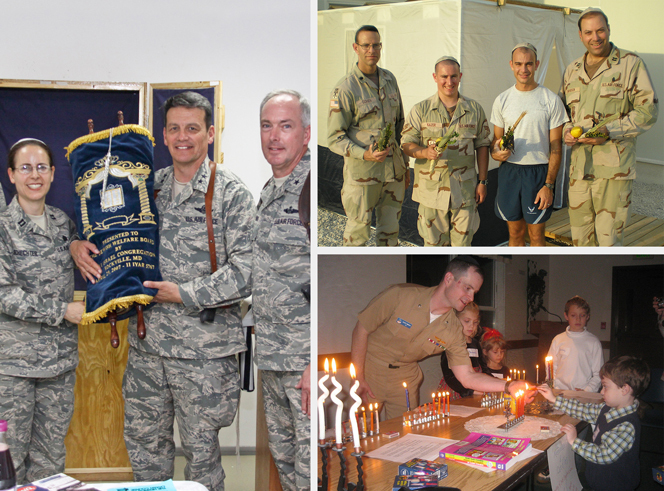 At JCC Association, I was soon immersed in writing about one of its programs, JWB Jewish Chaplains Council and the work it does supporting those members of the rabbinate who choose to enter the military, to minister to the spiritual needs of those who protect our freedom – as both Jews and Americans. You might want to ask just what JCC Association, the leadership organization for more than 350 JCCs, YM-YWHAs and camps across North America, has to do with Jewish chaplains. That would be a fair question. But that, in a way, is the history and backstory to the JWB. So let me take you back to July of 1775, the Continental Congress established the first military chaplaincy to serve the nascent American army. The move was not without controversy, this being the United States: Some felt that the government agreeing to pay these men $20 a month was a violation of the principle of separating church from state. Up until the Civil War, there were no Jewish chaplains, but in July of 1861 a Hebrew teacher, Michael Allen, began serving the 65th Regiment of the 5th Pennsylvania Cavalry. He served them proudly and well, according to the men in his unit, that is, until a worker from the Young Men’s Christian Association visiting them, found out that the chaplain was neither Christian nor ordained clergy. He made such a ruckus that Allen resigned. His commanding officer enlisted an ordained rabbi, Arnold Fischel, to apply to be chaplain as a test case. He also had the Board of Delegate of American Israelites to go to bat for the chaplain. And soon, President Abraham Lincoln intervened, helping to overturn the regulations prohibiting chaplains of other faiths from serving. Fast forward to World War I, when suddenly a large number of young Jewish men were to be drafted into service. Within three days of the United States entering the war, 22 national Jewish organizations – including a collation of Young Men’s Hebrew Associations, that’s a key element as we go forward — formed the Jewish Board for Welfare Work to serve the religious and morale needs of Jewish military personnel. The organization went through some growing pains and name changes in a very short period of time, but was considered a very effective organization on a national scale and finally became know as the Jewish Welfare Board, and given official government recognition. The United States government did not want to be in the business of saying who was a rabbi and who was not, so one of JWB’s main duties was to recruit and endorse chaplains. Representatives of the Agudas Ha-Rabbanim, Central Conference of American Rabbis, Eastern Council of Reform Rabbis, New York Board of Jewish Ministers, Union of Orthodox Jewish Congregations and United Synagogue of America were all under the same roof, so to speak. After the war, chaplains continued to be a presence in the reserve. Because JWB had developed such an effective national infrastructure and had demonstrated its ability to coordinate activities between diverse Jewish agencies, the Young Men’s Hebrew and Kindred Associations, then the umbrella organization for those individual agencies, agreed to merge together and for JWB to assume leadership. In 1921 the National JWB was launched, organized into two divisions: Army and Navy services and Jewish community center activities. As the Jewish population of this country shifted in the post-World War II era from being an urban one, made up of immigrants and their newly American children, to a suburban, assimilating one, the organization that oversaw all this, changed, too. In 1990, JWB changed its name to Jewish Community Centers Association of North America to better reflect the agency’s evolved scope and mission. At that time, the JWB became an agency within JCC Association. Which explains why someone who is the communications manager at JCC Association is standing here today, speaking about the work of the JWB. Jewish chaplains have continued to serve, not only Jews, but like other chaplains, all military personnel, since that first World War draft. One of the famed “four chaplains,” who went down with the USS Dorchester, as it transported soldiers to battle in 1943, was a Jew. The ship, torpedoed by a German U-boat, was doomed. Rabbi Alexander Goode, along with three Christian colleagues, gave away his life jacket to a soldier as the supply ran out. He and his three colleagues died in the icy waters off of Greenland, and are remembered to this day for their service and interfaith solidarity. Jewish chaplains have served in Korea, Vietnam, Iraq and Afghanistan, as well as in peaceful outposts all over the world and in this country. They serve during peacetime, wherever there are soldiers stationed, and have held seders in Okinawa and shaken a lulav and etrog in Kuwait. Today there are approximately 10,000 Jews in the military, and 56 Jewish chaplains, both active and reserve duty, to minister to them. Other Jewish endorsing agencies, such as Aleph, exist, but JWB Jewish Chaplains Council is the only one that will vouch for rabbis from all streams of Judaism. The council continues to represent Orthodox, Conservative and Reform movements, and includes members from each of the denominations’ respective rabbinic councils. The council comprises 16 rabbis, four from each of the major streams of American Judaism and four active-duty chaplains. In the field, chaplains go where our troops go. To assist them JWB publishes a variety of informational materials about holidays, mourning and various services it provides; and it conducts annual training programs for chaplains, and Jewish lay leaders who serve in their stead when none are available. As well, JWB send Jewish military personnel care packages throughout the year, including at Chanukah, Purim and Pesach, bringing a small ta’am, or taste, of home and tradition to men and women serving in far-off places, where they may be the only Jew. When someone like Rabbi Geller, my mom’s cousin, has an issue that cannot be resolved — like keeping his beard, where Jewish law and military regulations collide — the JWB often gets involved. Our director, Rabbi Harold Robinson a retired rear admiral, and has strong ties to the Department of Defense, the Chief of Chaplains, members of Congress and the Veterans Administration, and he recently became the first rabbi to chair NCMAF, the National Conference on Ministry to the Armed Forces. JWB lobbies Congress for Jewish soldier’s rights, including such things as wearing a kippah while in uniform, or to assure that kosher food is available for those who need it. JWB was among the lead organizations seeking legislation that led to establishing a Jewish Chaplains memorial on Chaplains Hill in Arlington National Cemetery. Through oversight, the 14 Jewish chaplains who had died while serving in the military were not represented; but in 2013, the memorial was dedicated in their honor. 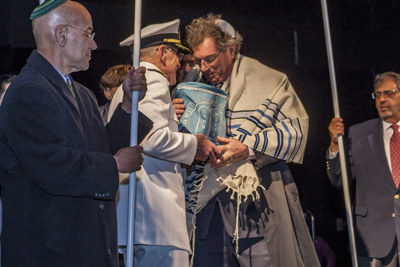 One of JWB’s recent — and very popular — projects was Torah’s for our Troops. Launched in 2009 at the Jewish Federations of North America General Assembly, it raised enough funds to complete six, small, halachic Torahs that can easily be put in a backpack, run through airport security and gotten to remote bases and aircraft carriers. In some cases, individual communities took on the projects, and I was privileged to take part in the ceremony completing the final letters of the fifth Torah at the JCCs of North America Biennial in 2014. On the USS Midway in San Diego, I then watched as the community transferred the scroll to the JWB’s possession. That program has just recently been sunset, for the needs have changed. With the draw down of troops in Iraq and Afghanistan, JWB has turned its focus to assisting our veterans. One of its traditional, recognized roles is to serve in VA hospitals, but it is clear that veterans and — and their families — need other support as well. Project Welcome Home seeks to raise awareness to the presence of our veterans, and is completing a pilot program in six JCCs around the country, and is the first faith-based program to be recognized for its work with veterans and their caretakers by the Elizabeth Dole Foundation. The JCCs in the pilot agreed to offer reduced membership and other services to veterans, their families, and family members of those currently on active duty. The project seeks to better integrate Jewish military families into our communities, help connect them to programming and services from which they will benefit and provide a community welcome mat. Some of the pilot sites are offering their first round of visible community programming this weekend, with the coincidence of the Shavuot and Memorial Day holidays. In 2014, JWB Jewish Chaplains Council printed a new siddur, or prayer book, for use of Jewish military personnel. This siddur represented the best of what American Jewry can be when it gets out of its own way. Rabbis of the three major Jewish movements — Reform, Conservative, and Orthodox — sat down at one table and agreed on what text would be included in a siddur meant for all Jewish troops, men and women, affiliated and not, both halachically and self-identified. This siddur, which includes a forward from President Barack Obama, has inclusive language, and traditional translations. It is easy to follow no matter which parts you choose to use. JWB printed a first run of 10,000, which are used on bases in this country, as well as overseas, by Jewish service men and women and their families. There are only about 1,000 left to send out and JWB is raising funds to head into a second printing. Rabbi Robinson, the JWB’s director, was a rabbinical student at Hebrew Union College during the Vietnam War, and as a self-described, lifelong liberal, was more likely to be protesting our involvement in Southeast Asia than supporting it. While he was a student, the Central Conference of American Rabbis (CCAR), the rabbinical council for Reform rabbis, repealed its requirement that students at HUC “volunteer” for a military commission. Instead, they were to submit to the draft lottery for active duty, as would anyone else their age.